What Makes Camden’s Cocktails Different? Why fit in when you were born to stand out? 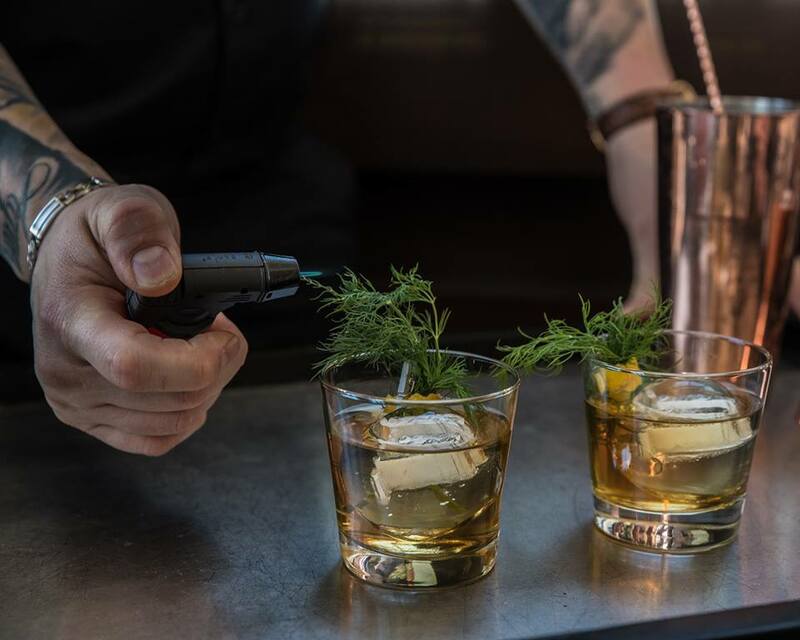 At Camden Cocktail Lounge, we’re proud to say that our cocktails are a little different…and that’s what makes them so incredible. Culture and cocktails come together. In browsing the drinks menu, one of the first things that will strike you is the unusual names of the cocktails. Fresh & Easy, The White Tiger, Fire & Ice, and Great Godfather are just a few of the intriguing cocktail names on the list. Each drink has a musical muse and a story; for instance, the “Great Godfather” is inspired by James Brown, the “Godfather of Soul”. You’ll feel like rock royalty as you sip this cocktail, which is made with Bulleit Bourbon, amaretto, meletti amaro, and served with a blood orange sphere. You can visit our two respective posts on the cocktails, here and here, to get the backstory on more of the offerings on our menu! In spite of the always creative takes, at their core, several of our cocktails are inspired by classic drinks. For example, our Camden Sour is inspired by the classic drink known as the whisky sour. The classic whisky sour is a mixed drink made with whiskey, lemon juice, sugar, and optionally, a dash of egg white. The Camden Sour is like a tricked out version! It is made with Bulleit 95 Rye, orgeat, lemon, Zinfandel port, and an egg white. The flavor of rye pairs beautifully with the sweet-citrusy flavor of orgeat, which works nicely with the zippy lemon. Zinfandel port adds a rich sweetness that separates it from the classic version of the cocktail; the egg white imparts a pretty finish and a rich texture to a drink that truly supersedes its initial inspiration. Throughout the menu, you’ll notice ingredients that may sound a little foreign. That’s because our mixologists employ some unexpected, but always delicious, ingredients in cocktails. For example, both the Camden Sour and our Frenchy cocktail are made with something called orgeat. This is a sweet almond syrup which is flavored with orange flower water, and it adds a sophisticated touch of sweetness to cocktails. Alternately, while you’ve probably seen matcha before, you probably haven’t seen it used much in cocktails! It’s one of the key ingredients in our Matcha Maker cocktail, which is made with Casamigos Blanco tequila, agave, lemon, mint, and matcha powder. 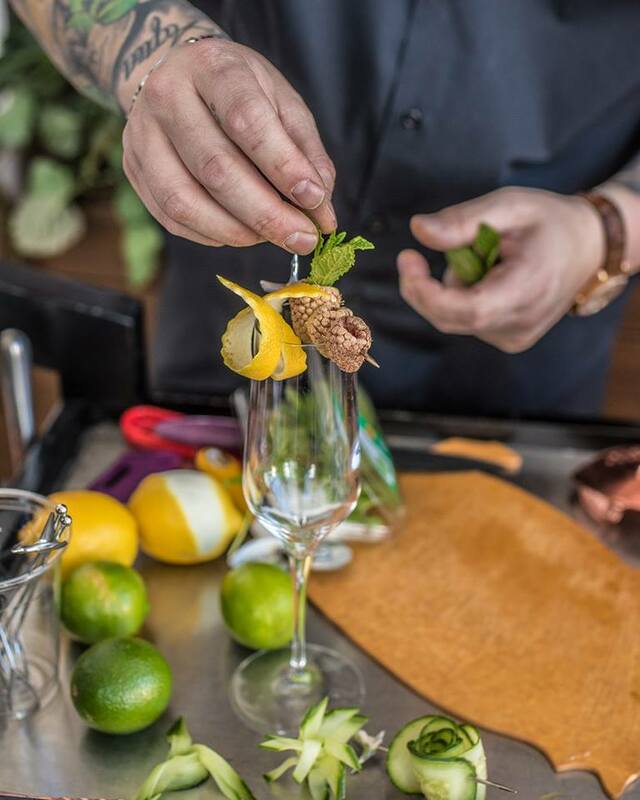 Mixology meets molecular gastronomy at Camden! While we don’t get too “weird” with our cocktails, they do feature unexpected creative flair. For instance, with our White Tiger cocktail, which is made with Tanqueray Gin infused with jalapeno and sage, cherry juice, and Meyer lemon, the garnish is very unique: jalapeno cotton candy! Or take our Green Goblin cocktail. Made with Cruzan Rum, lime, sugar, and a nitro-muddled herb blend, it’s served with an herb sphere for a sophisticated and unusual finish. Another thing that sets our cocktails apart? The setting in which they’re enjoyed. 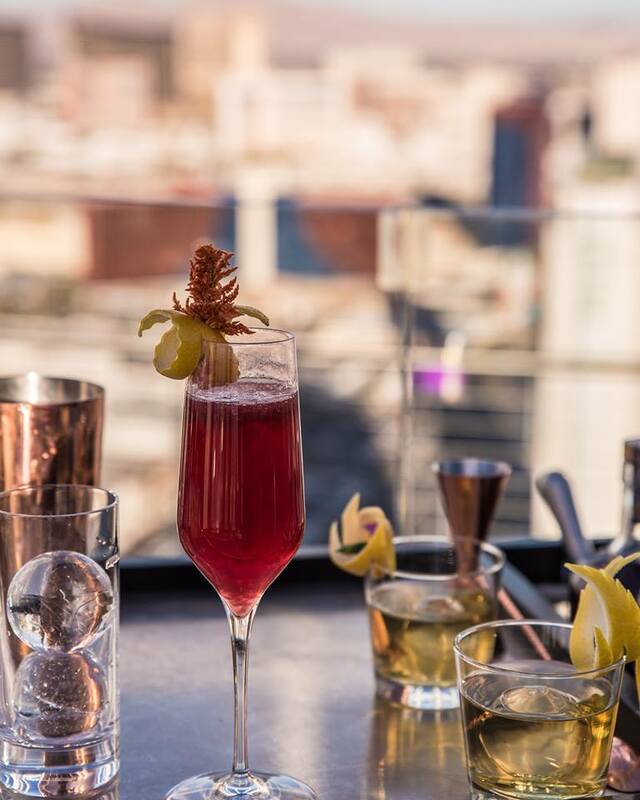 In spite of its location right at the base of the newly renovated Palms Casino Resort, Camden Cocktail Lounge offers what feels like a luxuriant, decadent-feeling getaway right in the center of it all. The interior is opulent and well appointed, offering guests an experience “akin to modern and mysterious library”. Details like bookcases and lush seating add to the luxe feel of the space, but don’t worry: we have modern details like flat screens, too. Overall, it’s a comfortable and sophisticated environment which is perfect for sipping a cocktail (or two). Camden Cocktail Lounge is just like you: a little different. And we wouldn’t have it any other way! We hope that you’ll visit our Las Vegas Lounge soon so that you can sample our creative cocktails for yourself. Have you tried a cocktail at Camden Cocktail Lounge? Previous PostPrevious What is the Difference Between a Bar and a Nightclub?